The M18™ Compact Blower delivers the fastest jobsite cleanup. The M18BBL-0 offers a best in class power to size ratio. 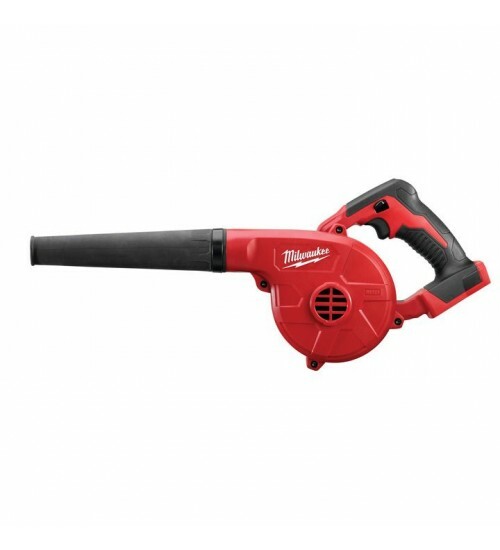 The M18™ Compact Blower has power control that includes a 3-speed electronic switch, lock-on and a variable speed trigger which allows for versatile clearing power. This blower moves air at 257kph and 100CFM for class-leading performance. Featuring a shock-absorbing polymer body and a crush resistant nozzle the M18™ Compact Blower delivers jobsite durability. Included is a 228mm extension nozzle to clear dust and debris easily from the ground or overhead. The M18BBL-0 also comes with a universal inflator/deflator. Works with all Milwaukee® M18™ Batteries (batteries sold separately).